All the Little Shops Limited (ATLS) is registered in England, company number: 6238613 and is operated as a group marketing portal acting only as an online marketing portal for independent retailers in town centres. Any contract of sale is between the retailer and the customer only. Basic listings on the website are FREE to independent retailers. Premium listings allow independent retailers to showcase a selection of their products and services online. Some retailers will use our secure e-commerce payment gateway via SagePay. Some retailers will simple showcase a selection of products or services that are available and use our downloadable incentive vouchers. Our objective is to help independent business trade on more of a level playing field with the larger multiples and promote Local Shopping. Products and descriptions of goods are added by individual retailers and therefore ATLS accepts no responsibility for what is placed by those retailers on this website. All retailers have agreed to our conditions and our code of conduct which include the EU distance selling directive that is summarised here. We reserve the right to make changes to our website, policies, and these Conditions of Use & Sale at any time. You will be subject to the policies and conditions of Conditions of Use & Sale in force at the time that you use the website, unless any change to those policies or these conditions is required to be made by law or government authority (in which case it will apply to orders previously placed by you). If any of these conditions are deemed invalid, void, or for any reason unenforceable, that condition will be deemed severable and will not affect the validity and enforceability of any remaining condition. When you visit our website and/or purchase goods from this website, you accept the following terms and conditions of use. Please read these carefully. You may have other rights granted by law and these Terms and Conditions do not affect these. Any information found on the web site is intended for guidance only and you understand that use of the site is at your own risk. Any material or data downloaded or obtained through the site is at your own discretion and risk. We will not be liable for damage to, or viruses that may affect, your computer equipment, software, data or other property as the result of your access to, use of or browsing of this website or your downloading of any materials, data, text or images. This website is subject to change on occasion without prior notice. All copyright and other intellectual property rights in and to content included on the web site, such as text, images, design, layout, look, appearance and graphics is the property of All The Little Shops Limited or its content suppliers and protected by UK and international copyright laws. If you need more information or have any complaints about any goods or services you purchase via this portal please contact the individual retailer. To purchase from retailers you must be over 18 and resident in the United Kingdom. By submitting your order you are offering to buy the goods and allowing the retailer and ATLS to use your personal details for the purposes of supplying goods (including passing your details onto couriers and other subcontractors). ATLS may contact you with special offers from time to time. We will not use your details for any other purposes or supply it to any third parties. Retailers are not obliged to supply the goods to you until we have confirmed acceptance of your order and this is when the contract is made. Normally goods will not be shipped until payment has been received and/or funds cleared. See individual retailer's terms and conditions and view the ATLS code of conduct. All ATLS retailers aim to despatch goods to you within 3-5 working days. See individual retailer's terms and conditions where indicated and view the ATLS code of conduct. All ATLS retailers aim to package the goods well to avoid damage in transit. Please note your right to cancel does not apply to items that have been opened, installed or used.See individual retailer's terms and conditions where indicated and view the ATLS code of conduct. The use of ATLS online portal is at your sole risk and you assume all responsibility for connection to our site and agree to indemnify ATLS from and against all claims, damages, and expenses arising from use of this site. Access to the website should comply with our terms and conditions. You shall act in accordance with law custom and good faith on use of this site. All copyright and other intellectual property rights in and to content included on the web site, such as text, images, design, layout, look, appearance and graphics is the property of ATLS or its content suppliers and protected by UK and international copyright laws. The contents of the web site may be downloaded printed or copied for personal use only. ATLS respect all copyright, brands, trademarks, licences that are uploaded by retailers. This site and contents are displayed solely for the promotion of independent retailers under the banner of ATLS. Products and services available in the UK, Europe and Worldwide. Neither content nor trademarks, pending or otherwise may be used, reproduced, copied or modified without written consent from ATLS. It is strictly prohibited to link this site with any other site without prior permission from ATLS. 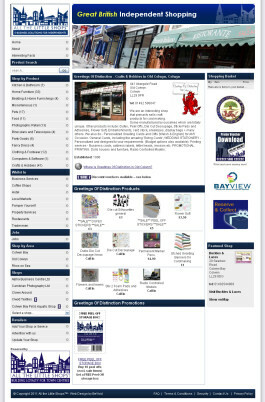 All the Little Shops Limited (ATLS) operates as an on-line marketing portal to help independent retailers trade on-line via website software called www.allthelittleshops.co.uk. Our basic website listings are FREE and our e-commerce service is subsidised and designed to help independent retailers embrace e-commerce and e-business benefits and test the market. Any contract of sale is between the retailer and the customer only. In return, retailers who list products for sale on-line, agree to offer FREE postage and packaging. Products and descriptions of goods are added by individual retailers and therefore ATLS assumes no responsibility for what is placed on this website. Retailers not wishing to take advantage of selling on-line may list their products as: Available in store only. Some Retailers may take advantage of our promo voucher offer - designed to give the shopper better value and encourage visits into the shops. Retailers using this website agree to our Code of Conduct and our Terms and Conditions. Operate a returns policy and always respond to customers queries within 48 hours where ever possible. Abide by EU distance selling directive - see here. Respect customer privacy and data protection. Offer FREE postage and packing. Keep the products listed up to date. Not to use the website for fraudulent purposes, or in connection with a criminal offence or other unlawful activity. Not to send, use or reuse any material that is illegal, offensive, abusive, indecent, defamatory, obscene or menacing; or in breach of copyright, trademark, confidence, privacy or any other right; or is otherwise injurious to third parties; or objectionable; or which consists of or contains software viruses, political campaigning, commercial solicitation, chain letters, mass mailings or any "spam". Not cause annoyance, inconvenience or needless anxiety. are registered trademarks of All the Little Shops Limited.